The film is a parody and needs to be taken with a grain of salt, sure it has a little more crude humor than some of other Mel Brooks films but as a film of the times, it actually was hilarious. Some holds up really well in spoofing westerns at the time. Though by today's standards some of the racism humor wouldn't be acceptable they need to realize it is satirizing it as you said, they are making fun of all the puns and idiocies of the bigotries at the time. 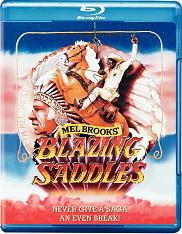 I love Blazing Saddles. It's a movie that has aged well but it is not for everybody.